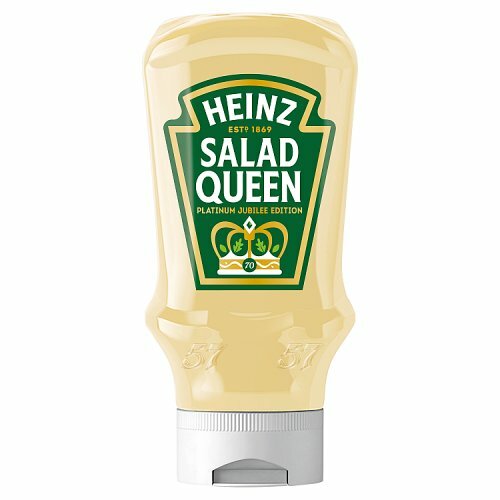 Heinz Squeezy Salad Cream Top Down is a modern take on the original and celebrated Heinz Salad Cream. Unlike the traditional glass bottle, this version comprises of a squeezy bottle with the lid pointing downwards. The major advantage of Heinz Squeezy Salad Cream Top Down is that it is much easier to use – there's no need to spend wasted minutes patting the end of the bottle, even when there is hardly any salad cream left. The salad cream itself is unchanged, offering that instantly recognisable flavour; tangy and more vinegary than mayonnaise, and perfect for adding that certain something to an otherwise bland salad. Most popular with customers in France, Italy, United States of America (USA), Germany, Netherlands, Spain, Canada, Portugal and Denmark, but you can buy Heinz Salad Cream Squeezy Top Down for delivery worldwide. One of our Heinz branded products. Water, Spirit Vinegar, Rapeseed Oil (22%), Sugar, Cornflour, Mustard Powder, Pasteurised Egg Yolks (3%), Salt, Colour - Riboflavin. After opening refrigerate and eat within 8 weeks. Best before: see cap. Mixed feelings. I think this is an acquired taste. 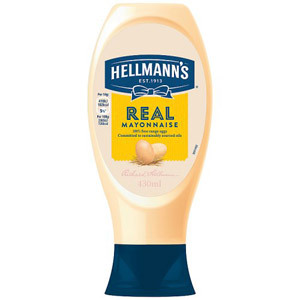 I don't dislike it, but I don't think it will replace my regular mayonnaise, nor can I see using it on regular salads. For reference, I love mayonnaise but I do not like Miracle Whip a midwestern US creation and staple and I do not think this tastes like Miracle Whip. I used this in a seven layer salad and enjoyed it layer fresh lettuce, spinach, celery, peas, crumbled bacon lardon, sliced hard-boiled egg, Heinz salad cream or mayonnaise... salt, pepper. I wish I could rate it 5 stars but unfortunately, both of the bottles we received had poor quality lids and break very easily or don't stay closed properly. With that being said at least my mother in law and husband thoroughly enjoyed it to the point where we ordered 2 more in our next order. I'm American and had never had it before but it's better than miracle whip but similarly tangy, just not super sweet. Perfect for many things and weirdly delicious on fish fingers. I love my salad cream, but have a hard time finding any here in the U.S. I don't like the American dressings like ranch etc. Can't get used to the taste at all. So happy I can get my fill from here. I have always preferred Heinz salad cream to mayonnaise but I was disappointed with this squeazy topdown version. It didn't taste like I remembered. The consistency is too thick and it doesn't come out of the bottle so easy. The overall taste is not creamy, it has an overpowering taste of vinegar. I think I only had a couple of servings and threw the bottle the bottle out, in the end. I didn't like it. Heinz salad cream reminds me of summers as a child.The new plastic bottles are ideal here in France as most of the floors are tiled.When the grandchildren drop the bottle it simply bounces.The squeezy bottle also allows us to use up every last drop of salad cream with no waste.We have tried other brands but always come back to Heinz original. Heinz Salad Cream need I say more? This is a must in our house at any time of year. I am always buying two bottles at a time. I can buy it in our local supermarket, but they are the smaller glass bottles and they want 5 euros a bottle. British Corner Shop thank you very much!! It's certainly good to have 'the real thing'. There are cheap copies, but they don't have the same creaminess and tang. 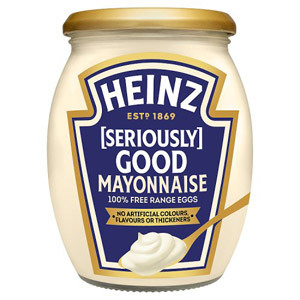 I'm surprised that Heinz have taken so long to come up with the low-fat advertising strategy -- even this full fat version is just 27% fat, which beats a standard mayonnaise by miles and even some diet versions. So it's a reasonably healthy and convenient way to add interest to salad or pep up your egg mayonnaise -- or even cottage cheese if stuck on a diet and desperate for taste. Living in a country that does not sell decent Salad Creams can be extremely annoying at times. 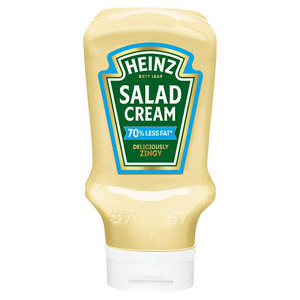 Luckily this Salad Cream from Heinz is available on BCS. 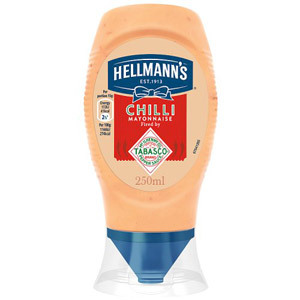 There is no real rival to this fantastic creation and the squeezy bottle is an awesome addition to this fantastic product from Heinz. Heinz salad cream has a distinctive taste that I haven't found in any other brand of salad cream. It's a mix between a vinaigrette and a mayonnaise with a hint of mustard. It tastes natural, unlike other white sauces and creams that you can find in shops like Lidl. I rarely use it as a salad dressing, though. I like it in sandwiches, with fried fish and breaded chicken. I've recently started dieting and salad cream is one of the only treats I'm allowed. It's a lot healthier than other salad dressings, such as blue cheese and ranch, and I think everyone would agree that salad is a little boring without a dressing, so I love a bit of salad cream with it. I definitely recommend Heinz over other brands as you get what you pay for in terms of quality. Salad just doesn't taste the same without Heinz Salad Cream. I ordered the squeezy bottle for ease and cleaner storeage. I think it beats mayo any day of the week! There is no better salad dressing than Heinz Salad cream. 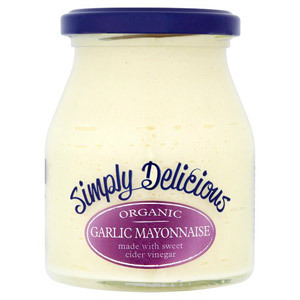 A creamy, tangy compliment to all salads and crudites, for dips. I like to have half a tomato with some pepper and some Heinz salad cream dressing on top for a healthy refreshing snack. The squeezy bottles are better than traditionnal ones as they are easier to store and create less mess. Would you like to write a review for Heinz Salad Cream Squeezy Top Down?